So for many casual readers who don’t closely follow the [news], all they know about the [news] is from the headlines and alerts of articles they don’t read. But push notifications are not news stories. They are snippets often written on deadline, akin to headlines that deliver the jist [sic] of a complicated event but little more. Yet there’s growing anecdotal evidence to suggest that readers may view news alerts as standalone stories, taking them at face value without clicking through to read more. But headlines’ effects don’t end there. Headlines actually impact the way we read and remember articles. Psychologists have long known that first impressions really do matter—what we see, hear, feel, or experience in our first encounter with something colors how we process the rest of it. Articles are no exception. And just as people can manage the impression that they make through their choice of attire, so, too, can the crafting of the headline subtly shift the perception of the text that follows. By drawing attention to certain details or facts, a headline can affect what existing knowledge is activated in your head. 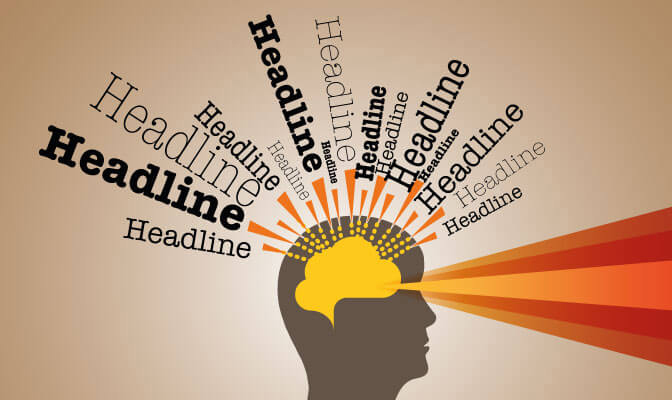 By its choice of phrasing, a headline can influence your mindset as you read so that you later recall details that coincide with what you were expecting. In terms of objective journalistic standards, bad headlines can violate one or more of the Eight Categories of Media Bias. The following four examples relate to the Israeli-Palestinian conflict, but the principles apply to headlines of all areas of coverage. 1. In one day, Palestinians stabbed Israelis in three separate attacks. A New York Times headline (which was subsequently changed) demonstrated a lack of context so bad, it actually created a moral equivalence between the terrorists and their victims. 2. This UK Daily Mail headline (subsequently changed) is an example of distortion of facts. You have to read the article to learn that Mohamed Fakih was killed in a shootout he instigated along with cohorts from his Hamas cell. 3. This memorable Evening Standard headline from 2009 violates opinions disguised as news. 4. Not wanting to use the word “terror” in a headline, the New York Times resorted to some stunning lexical gymnastics to explain Palestinian youths stabbing Israelis — a violation of misleading terminology. 1. Why is it important for news organizations to provide accurate headlines? 2. What responsibility do you think publishers/editors have to provide accurate headlines that are not misleading? 3. Having read this post, what responsibility do you think you as the reader have to read the news with discernment? HonestReporting monitors the news for bias, inaccuracy, or other breach of journalistic standards in coverage of the Arab-Israeli conflict. HonestReporting believes that a fully informed public is essential to progress and understanding in conflict resolution. We believe Israel is entitled to fair treatment by the world press according to the same standards applied to any other country. We believe that public opinion is significantly shaped by media coverage. We believe that biased coverage of Israel distorts the public’s understanding of Israel and its motives, creating an obstacle to a peaceful resolution to the Arab-Israeli conflict. Pay attention to news reports about the Israeli-Palestinian conflict. Are events reported accurately? Headlines can greatly influence readers’ opinions about the news. The importance of an accurate headline is that most people don’t read every word of every article; they often just skim the headlines. Therefore, those who read just a headline are not accurately informed when the headline misrepresents the story. Publishing an inaccurate headline is the same as publishing an inaccurate story. Providing accurate reporting is the main point of their job. Publishers/editors should always provide accurate headlines that are not misleading. They should take this responsibility seriously if they want the public to trust them. Read the whole article and not just the headline/caption/1st paragraph. Also, read multiple news stories on the same event. It will give a more accurate picture of what actually occurred.